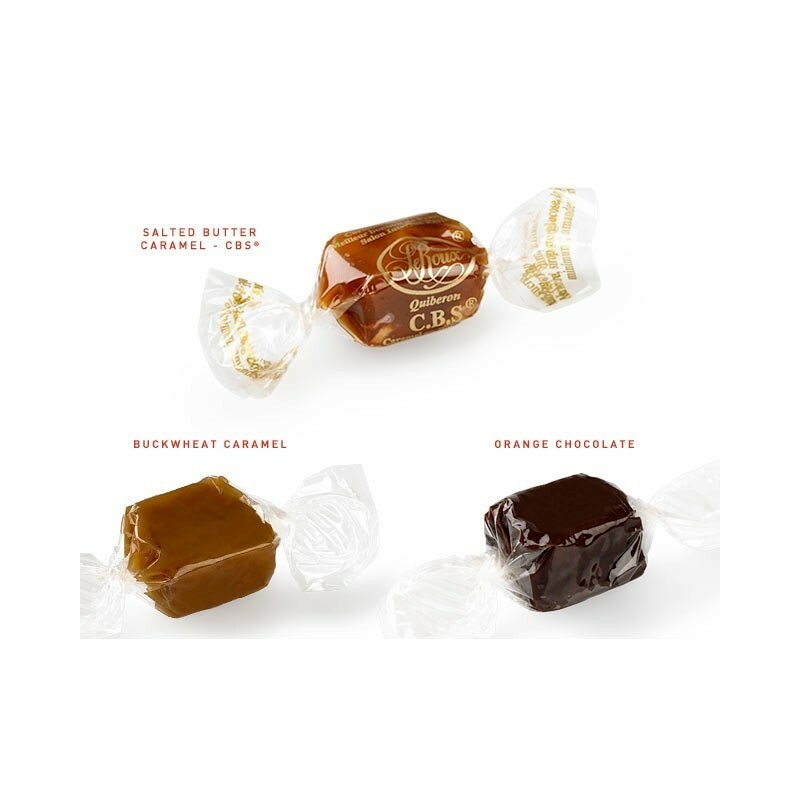 Maison Le Roux designs caramels according to the seasons! Diable rose, Orange-Ginger, tea, chocolate, raspberry, buckwheat, Pina colada, Hazelnut-coffee, Yuzu Macha, the famous CBS and our Spring/Summer collection: Pineapple-Pink peppercorns, lime and Timur Pepper strawberry. Assortments depend on the season. 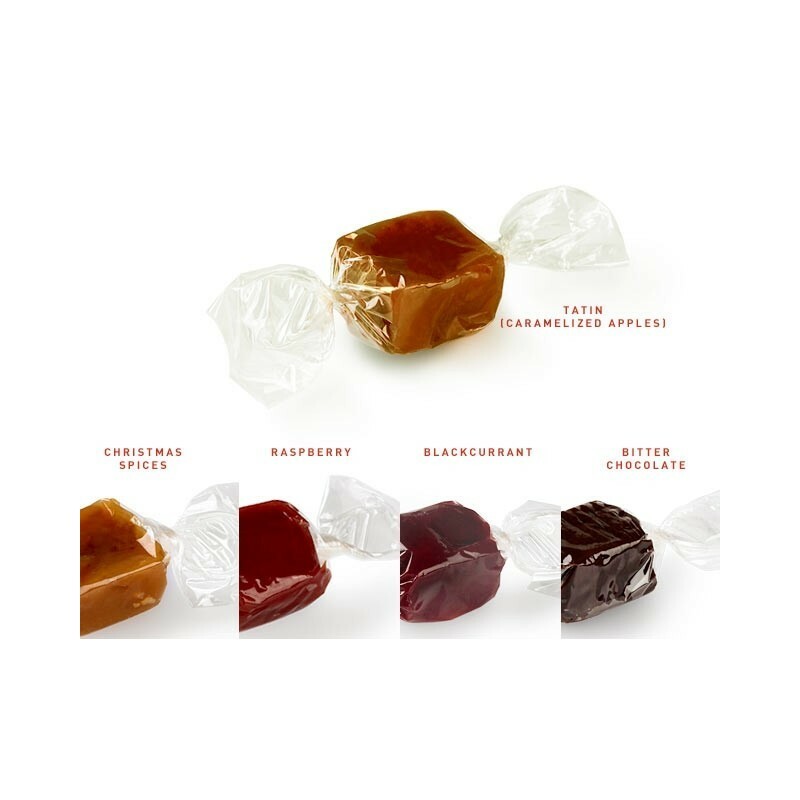 As our production is home-made, the composition of caramel assortments may vary according to availability and seasons. You can request your personal assortment (for instance one flavour only) directly from our shops, by phone + 33 (0)2 97 50 06 83 or by email. A tender marriage between salted butter and caramel prolonged with a last and delicate nuts and almonds crunchy… Our proud! In collaboration with the Brûlerie Caron, founded in 1974 and awarded« Best Coffee Roaster in France » in 2011, this new caramel « Coffee and Nut » combine Brûlerie Caron’s Arabica coffee with Piemont hazelnuts. A perfect harmony between coffee and a meticulous dose of the hazelnuts, essential ingredient of our C.B.S.®. The power of chocolate with the finesse of the caramel. With "Mélange des Seigneurs" tea infusion from Dammann Frères. A delicate aroma with an intense and perfumed savour. The raspberry and caramel : a light and subtle moment! Caramel with lemon zest, slightly acid. Morelly cherry powerful taste reveals in this autumn caramel. Cardamom adds a touch of exotism. Caramel softens the power of blackcurrant,and lets fully express its deep and secret aroma! Perfect union, with a rich character, combining black sesam from Japan and "fleur de sel" (salt) from Guérande. With lemon zest, refreshing and deliciously tangy. The Timur Pepper from nepal, a treasure of taste, is a small spicy peppercorn characterized by its citrus notes, pairs with sweetness the fruity aroma of strawberry. Taste the freshness of exotic fruits: banana, raspberry and passion. Just savour it for its originality. Rum, pineapple and coconut flavoured caramel. Taste our caramels as quickly as possible after their purchase: the quicker they are consumed after making, the more unctuous and fondant. 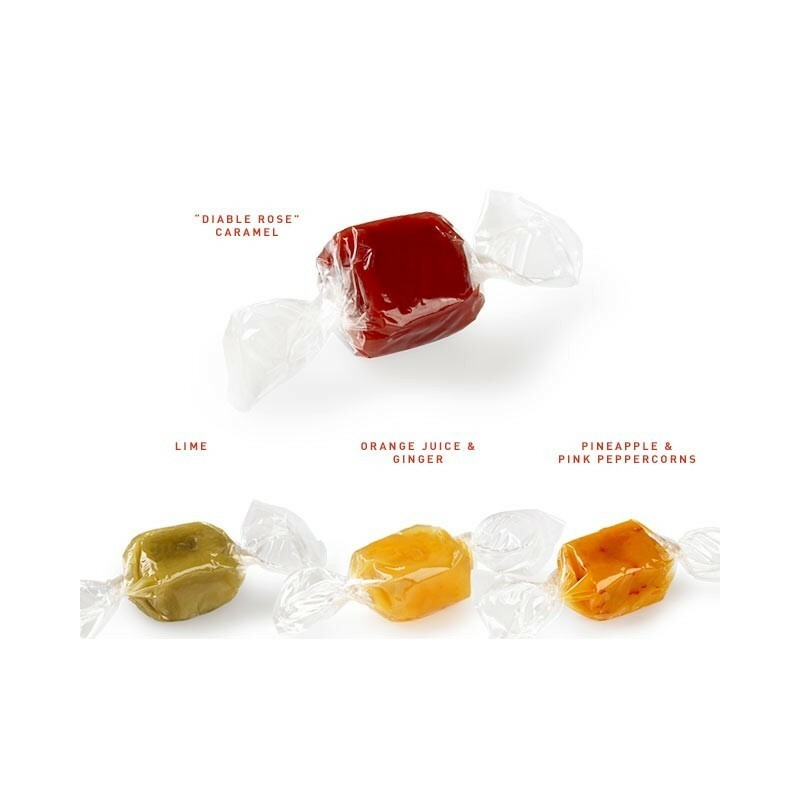 C.B.S.® and assorted caramels: sugar, CREAM, glucose syrup, BUTTER, LACTOSE, fruit puree (fruits and or juice : pineapple, strawberry, cranberries, lime, lemon, cherry, raspberry, passion, blackcurrant, orange, coconut, pear, sugar, antioxidant: ascorbic acid E300, acidifier : citric acid E330, fruit juices (orange, lemon, lime), fruits (strawberry, coconut, apple, banana, pineapple, cherry, pear (pear, antioxidant: ascorbic acid E300), raspberry, yuzu), cocoa butter, cocoa paste, candied orange (orange, sugar, glucose syrup), buckwheat, MILK, inverted sugar, tea, HAZELNUT, ALMOND, SESAME, coffee, salt, ginger, lemon zests, NUT, gellant: pectin E440i, rum, dark chocolate (cocoa bean, sugar, cocoa butter, emulsifier: SOYA lecithin, natural vanilla extract), spices, antioxidant: citric acid E330, essential oil of orange.